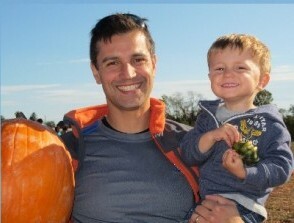 We wish to thank everyone who joined us at our Open House on Wednesday, October 22, 2014. 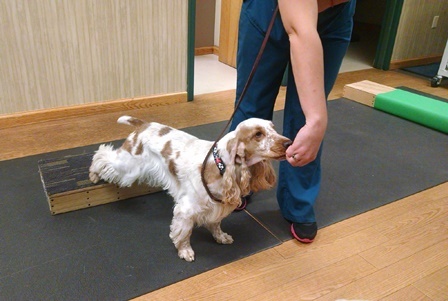 Our goal was to give you first-hand insight to the benefits of our Physical Rehabilitation and Regenerative Medicine programs and help you feel more confident that your pets have options to many different treatment plans as they mature. Dr. Kim Somjen, DVM, kicked off the event with an overview of the program. 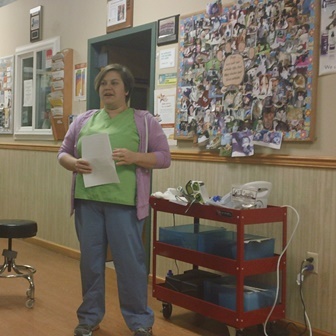 She shared her own personal experiences of how she became interested in the pursuing her certification in Physical Rehabilitation based on her own pets’ experiences and injuries. In addition, she explained how she has seen at the hospital many animals other than her own in pain and discomfort, either because of arthritis, weight issues or injury, and all she could offer is putting them on pain medication or supplements which wasn’t helping enough. She wanted to learn what else she could offer to help these animals. 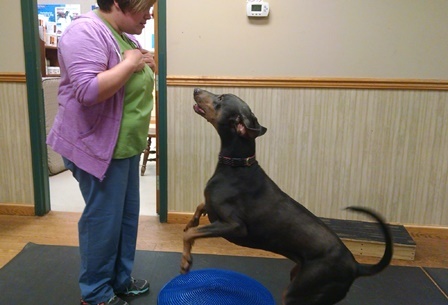 She is now pursuing her certification in Canine Physical Rehabilitation through the University of Tennessee. 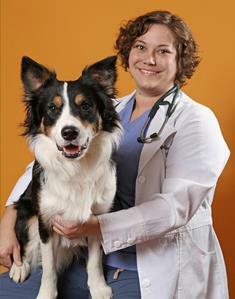 Even though the program focuses on canines, the therapies also apply to cats and exotics. Dr. Somjen explained that during physical rehabilitation, a variety of modalities are used to help the animal find optimal health. What’s normal for each animal will vary. The goal is to improve their comfort, manage their pain, increase range of motion, increase muscle mass, and increase physical stamina. The bulk of what is done to help the pet is physical manipulation. The dogs in the program are taught behaviors and use equipment for therapeutic exercise targeting certain muscle groups. For cats, it becomes more creative by trying to get them to do things on their own. 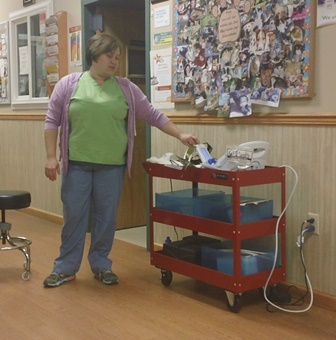 Physical rehabilitation has also worked with rabbits and rats in the BMAH practice. Almost any animal can benefit. Those with neurological problems can be retaught how to move, for instance. Dr. Somjen also explained the use of Class IV lasers, electrical stimulation units, and therapeutic ultrasound. The Class IV laser stimulates the cells to produce extra ATP, which is energy for the cells. This increases blood flow and helps heal damaged tissue. 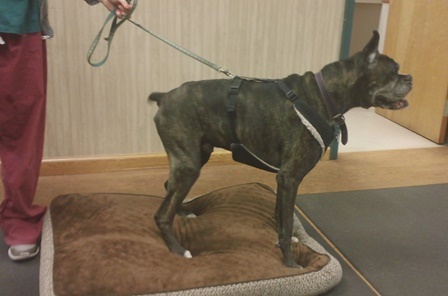 The electrical stimulation can be used both for pain as well as to build muscle mass in weak or paralyzed animals, and the therapeutic ultrasound can be used to heat muscle and help better stretch the tissue. 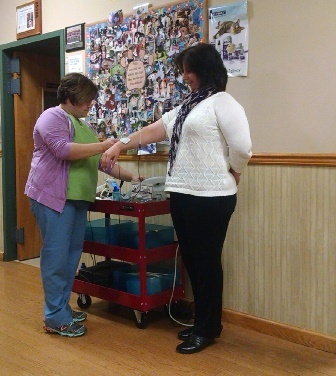 A visitor/client at the event took the opportunity to volunteer to experience the electrical stimulation unit herself so that all could see the unit in action and how the stimulation is applied. 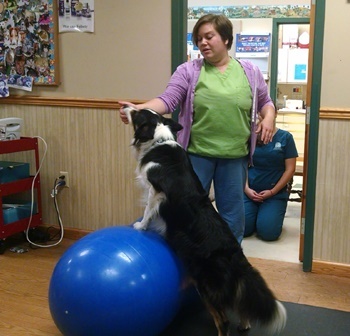 Physical rehabilitation can benefit not only dogs that have been injured, but also healthy dogs and canine athletes who can be taught to perform daily activities as well as activities related to sports safely, and to keep them conditioned to stay at the top of their game. Soft tissue injuries are different from arthritis. These injuries can involve muscle pain, not simply pain in the joints. Physical therapeutic exercises, stretching and laser therapy all contribute to the healing process. During Physical Rehabilitation, the dogs are taught behaviors and use specialized equipment as well as household items to achieve results. Canine demonstrations at the Open House were performed by dogs Raven and Rock It (patients in the program) as well as Dr. Somjen’s own dogs Berlin, Cherrybomb, Gadget and Chill. 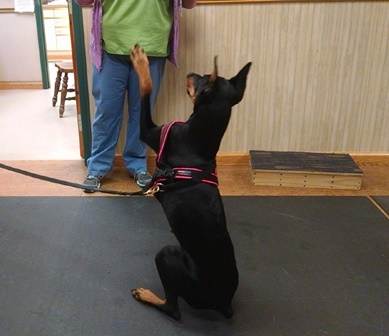 Each dog was different with regard to their physical limitations and therapeutic requirements. 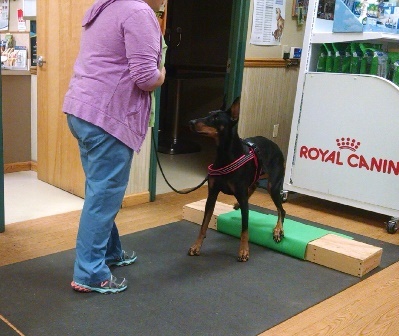 Chill was actually an example of a healthy dog that needed to be taught how to move safely and efficiently in order to prevent injury. 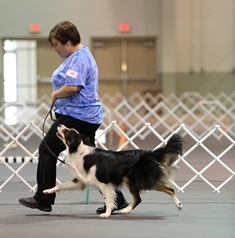 Therefore, the exercises demonstrated varied from dog to dog, and the visitors were able to see the many ways dogs can be helped through the program. Once again, thanks to all who attended our Open House on Physical Rehabilitation and Regenerative Medicine. 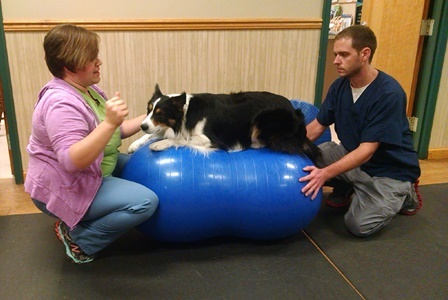 We hope this goes some way to enlighten our clients and readers of how Physical Rehabilitation can benefit your own pets. This entry was posted in Events, Exotics, General Pets, Veterinary Medicine, Veterinary Services and tagged Class IV Laser Therapy, Pet Physical Rehabilitation, Stem Cell and PRP Therapy. Bookmark the permalink.